The moral implications of modern warfare are confronted in this powerful drama. Tackling an ethical dilemma in a thought-provoking and suspenseful story, the gritty film stars Academy Award Winner, Helen Mirren ("Trumbo", "The Queen"), Aaron Paul ("Breaking Bad," Need for Speed), Academy Award Nominee Barkhad Abdi ("Captain Philips"), Iain Glen ("Game of Thrones,") and the late Alan Rickman ("Die Hard", "Harry Potter") in his final on-screen performance. Eye in the Sky follows Colonel Katherine Powell (Helen Mirren), a UK-based military officer in command of a top secret drone operation to capture terrorists in Kenya. Using remote surveillance and on-the-ground intelligence, Powell discovers the targets are planning a suicide bombing and the mission escalates from "capture" to "kill." But as American pilot Steve Watts (Aaron Paul) is about to engage, a nine-year-old girl enters the kill zone triggering an international dispute, reaching the highest levels of American and British government, over the moral, political and personal implications of modern military operations. "Eye in the Sky is compelling, offering the best elements of a drama and a thriller." 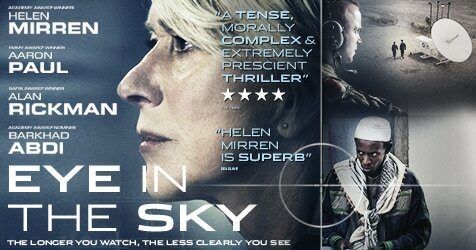 ​"Gripping and intelligent, Eye in the Sky is edge-of-your-seat cinema that also sheds light on a difficult and complex subject. " ​"I'm ready to call Eye in the Sky the best film of the year, thus far." ​"A tension thrill ride that leaves you in awe of the talent on screen and off. Saddening that this is Alan Rickman's final project but a worthy one."